in order to keep this blog up to date. Our reporter was on holiday hoping to see bonsai in Malaysia and Taiwan (which was not as easy as it sounds). A good turnout of members came to see Corin’s presentation and admire his exquisite trees. The presentation started with an introduction on how Corin got involved, his training and where he is now with bonsai. After 20 years in the business he is well known on the bonsai circuit for his talks and workshops. Corin then gave an illustrated talk with slides of trees from his personal collection in a timeline format, showing the various stages of their development. He is tending to specialise in maples and building a personal collection which also contains rarer varieties . One of Corin’s rare Maples. The colour and fine foliage are absolutely exquisite. Corin brought some specimens from his collection to the meeting and in-depth details were given on their history and development. He went on to explain what to look for in imported trees – China, Korea, Japan being the main sources – if grafted, their age and on-going development to style as bonsai and selection of pots. His knowledge of pots was also an interesting aspect – size, shape, depth, colour, and maker – which should complement the tree. Choice of pot is an individual thing and the pot may change during development of the tree as its height, spread, maturity and leaf colour are taken into consideration. It is usual for imported stock to arrive in pots that were too small with poor potting compost and the reason why trees don’t survive in the hands of those without the experience of re-potting. The difference in growing trees on the bench (outside) and in a greenhouse was discussed; also leaf cutting, and dealing with leaf problems, ie scorching and withering. In the UK, the end of June is usually the best time for leaf cutting maples when new buds are formed for growing on. The talk was completed with a demonstration on how to leaf cut a Cork Bark Maple. The selected tree was first trimmed and then remaining leaves were plucked off leaving a skeletal tree with its branch formation and new buds showing for processing to next stage. Cork Bark Maple being leaf cut for further development of the fine branches. Members also brought in their own bonsai for discussion with Corin and to get advise for further development. A big thank you to Corin for attending our meeting and providing us with a wealth of information, giving us food for thought and renewed enthusiasm to put his advice into practice. We shall look forward to seeing him again at the Greenwood Bonsai Bash, a free event, on 7 & 8 September 2013 in Nottingham. Next Meeting: 4 June 2013 at usual meeting place and time for a Workshop Session. Tree preparation for Club Annual Show on 7 July with presentation by club member Lee. Event will include trimming/pinching, fine wiring for branch definition, top dressing and cleaning pots. Members should bring along their trees for this preparation work. Sunday, 23 June 2013. Members’ Bonsai Study Group for finalising preparations for tree showing. Put into practice all you have learned about detailing and top dressing your trees and companion plantings. 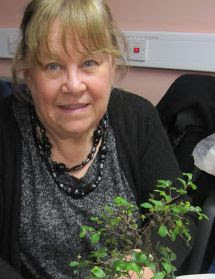 Members to bring their own trees to work on. Alan and Carol are opening their home for this event – come rain or shine, plenty of working space plus a light lunch and refreshments. This is an extra opportunity to learn, pratice and of course socialise. Further details will be circulated at 4 June meeting. Please support new ideas for the Club programme. Thank you.